Finally, Facebook Offers/ Deals is available in Australia. 1. 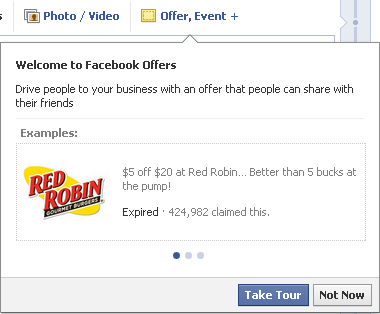 If you are a physical business and have a Facebook page you should be eligible. 2. Make sure your Fanpage is filled out with your physical location, work hours, about section etc. 3. Some page-owners will now see this new notification where you can do status updates. As mentioned this only looks to be available for physical business and is slowly rolling out to pages in Australia – so keep an eye on yours. It may not be available to all pages yet. It will be interesting to see how this new feature performs as I believe there is a huge opportunity for Facebook to compete with Google Offers/ Places.